As a writer, I’ve always hoped people would someday read my books, like for real (and not just in my dreams). I mean, that’s kind of the whole point, right? So I find it really moving when I get see their unbiased, book-loving reviews. 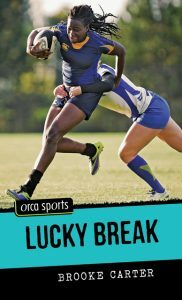 So when I came across a great review of my upcoming book, Lucky Break, I couldn’t help but feel very, very proud, and very, very grateful to the reader who so thoughtfully took the time to review my book. This reader connected with the book, and with my character, Lucy, and I cannot tell you how much that means to me. Thank you to all the readers — YOU ARE THE REASON. My book! That someone read! And reviewed!